I’ve put off writing this post for a few weeks. Like a disappointing race recap, I don’t want to talk about it. At the same time I want to be real here – as sad as it may be at times. It’s been easy for me to find other things to write about, as I pushed this post off for another week – races, running in the heat, strength training – but now I’m confessing my disappointment. I wrote about a few major changes I wanted to work on this summer in order to prepare for my winter marathons. Losing the marathon weight gain from the first part of the year (along with the Christmas, two birthdays, Valentine’s Day, and Easter weight gain) was a priority. I set a goal after OKC to lose a pound a week which would take me where I want to be when my training plan officially starts in August. I even had a few extra weeks in there for a plateau. Let me preface the rest of my post with this statement: For the last two years (post OKC marathon) I have lost all the weight I gained while marathon training – and then some. Eight weeks ago, I started my plan to get ready for fall training. 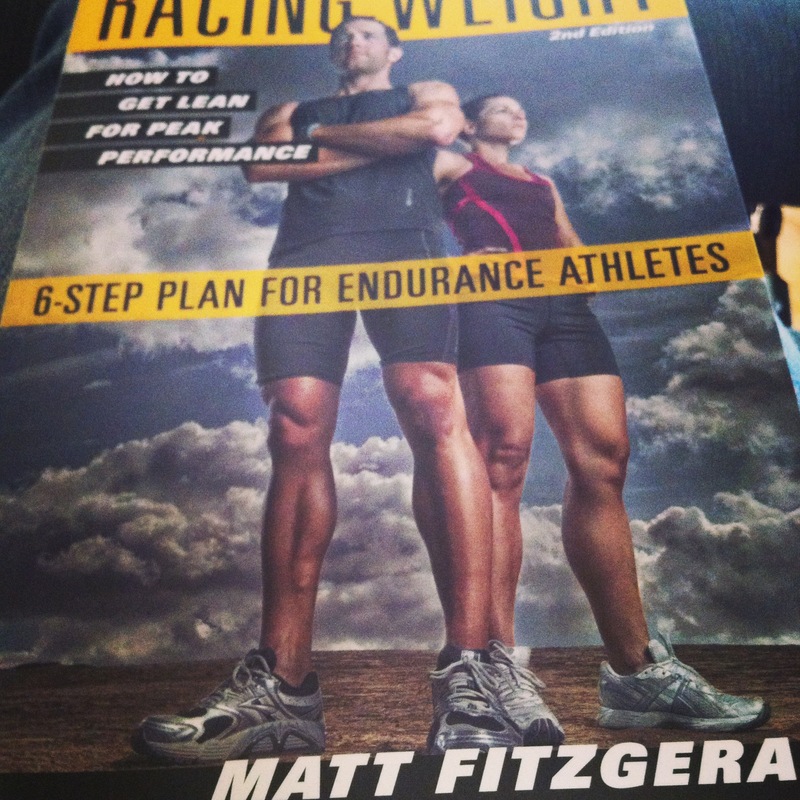 I read this book which helped me set an initial goal for weight & body fat percentage. It’s a doable goal. I started my strength training at the same time. My result so far with six more weeks to go? I haven’t lost a single pound. Not one. In fact, I’ve gained two. Every week, several times a week, I have weighed in the hopes of seeing the numbers drop. I even considered cutting my hair short in hopes of losing a pound. 😉 And yes, I know strength training changes things. So before you say “muscle weighs more than fat” know that I’ve been tracking body fat every four weeks. The percentage hasn’t dropped. To say I’m frustrated is an understatement. I’ve gone from someone who once rewarded 5 mile runs with an apple fritter to I don’t remember the last time I ate a donut. What has changed so that I’m not dropping weight? Other than working an extra 2 1/2 hours a day and snacking less, I’ve continued doing what I need to do to lose weight by following a higher quality diet. I eat whole grains, healthy fats (almonds, avocados), fruits and veggies. I keep my calories within the daily limits, and I’m training consistently. I even started a running streak on Memorial Day to see if that would help. My husband can sneeze and lose a pound, but my metabolism has always been slow. Thanks to genetics, yo-yo dieting in my 20s, and don’t mention what having four babies does to a body. For those who say losing weight gets harder at 40 – it looks like I got a jump start. As my husband smartly pointed out, “What’s more important? The number on the scale or running fast?” Well, of course it’s getting faster. I just can’t help thinking I’ll be faster if I’m lighter. I know I drive him crazy. The positive notes about the past eight weeks: I feel stronger and more flexible. I can feel my core strength propel me forward when I’m sprinting or doing hill repeats. A pair of jeans that stayed in my closet for six months is back in rotation again. 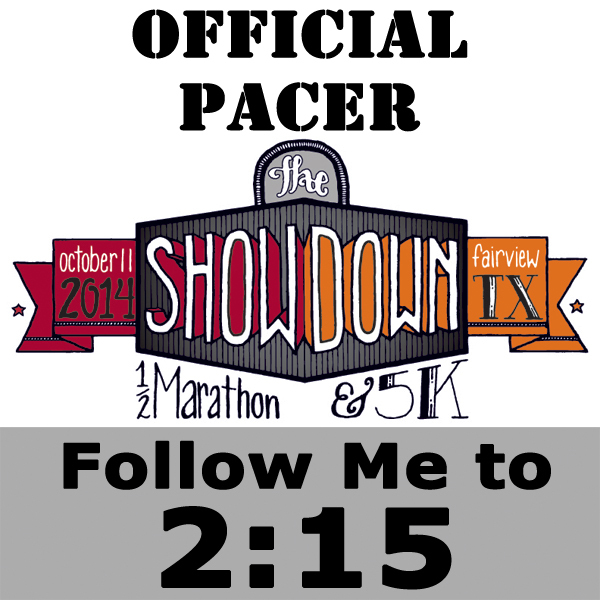 I’ve also been blessed with several opportunities this fall/winter that I never imagined – Houston Marathon ambassador, part of Team Chocolate Milk, and now my first pacing job. I know it’s not the stupid number that determines whether I’ll meet my big goal or not. I’m eating to run, not the other way around. I’m working hard to lay a foundation on strength and speed, and I don’t feel any slower (other than the heat and humidity factor). Overall, what matters most is not what the scale shows, but that I hang on to my joy of running. In the meantime, I’ll just keep doing what I’ve been doing. But maybe I’ll throw in some extra time on the bike. This morning I set off on my usual comfortably paced run. 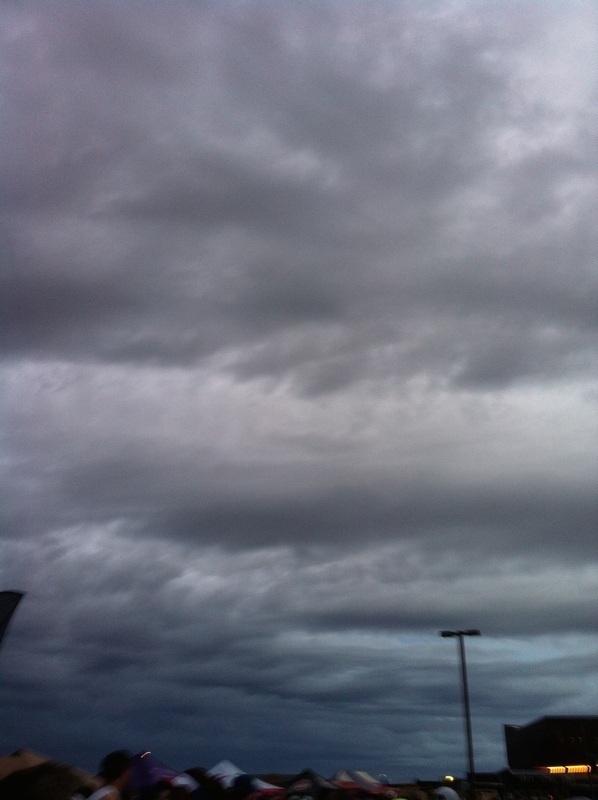 The weather was pretty much a repeat of last week: 76 degrees, 80% humidity. That’s why I was surprised to feel 20 pounds heavier this morning. It sucked the breath right out of me! Was I running with a pack on my shoulders? My energy was depleted before the first quarter-mile. I wanted to turn around, but if I’m going to need a shower, I’m going to get a few miles. What really threw me was yesterday. I rode the stationary bike for 45 minutes, then ran outside for 30 minutes. At 1:00 pm. 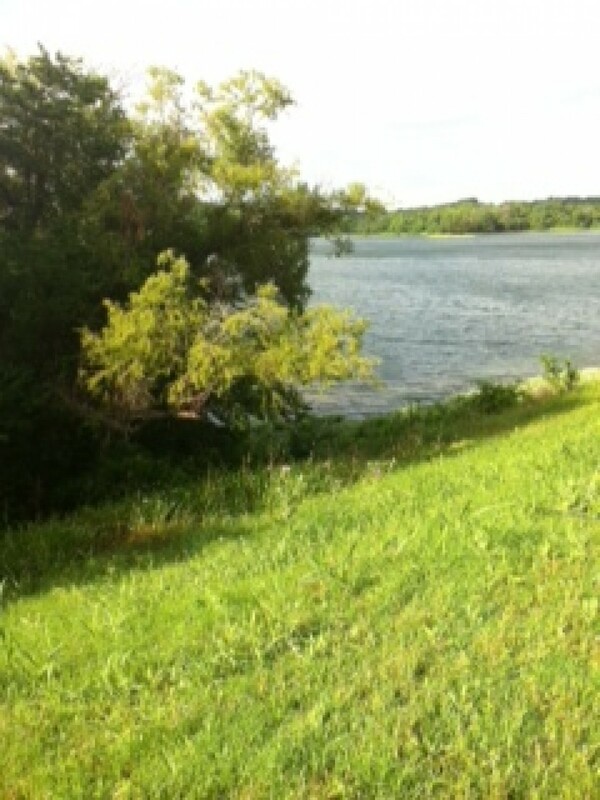 I was running an easy pace and sweating, but I felt good. I felt light on my feet. At 1:00 pm! But this morning, I was knocked down and reminded to lower my expectations. Tough runs show up at unexpected moments. 1. Hydrate. Water is good, but I’m a heavy sweater. 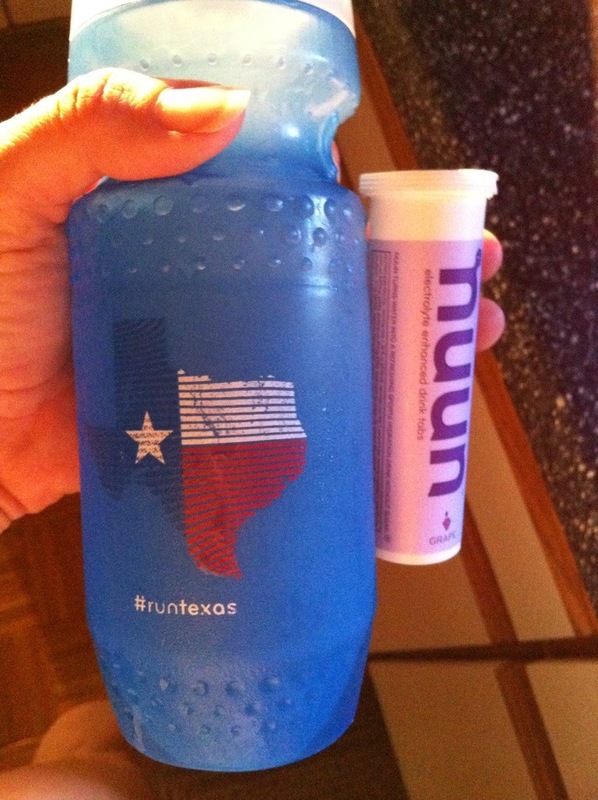 My go-to is Nuun to replace electrolytes. You can use whatever sports drink works for you, but I like the Nuun flavors, and it’s easier on my stomach during a run. 2. Pull out the pit-stained older tech tops. Save the good stuff for cooler days, like November. You say you don’t have sweat stains? Okay, sure. Meanwhile, you’ll see me sweating it out in my Dallas 2010 half marathon finisher shirt. Once upon a time it was white. I’ll spare you a photo. 3. A note from the book I’m reading which may or may not be my marathon plan. 🙂 More on that in a later post. So basically, get out and run in it. Cooler days will come, and the pay off for slogging through the heat and humidity with them. We’ll feel like we’re flying! 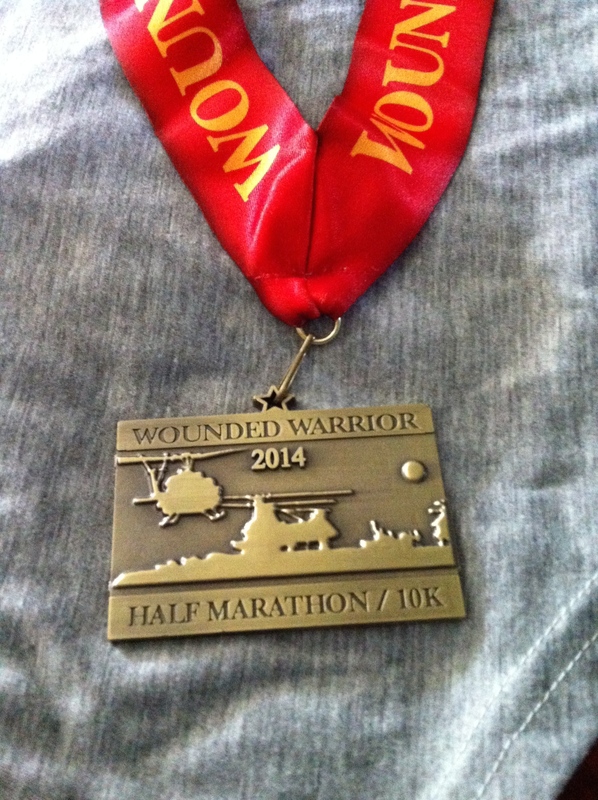 On Sunday, I ran the Wounded Warrior Half Marathon in Las Colinas. I ran this race for the first time in 2012, but missed last year due to an imminent home purchase and the six shades of purple on my foot. I enjoy the half marathon distance, but a race becomes extra special to me when the proceeds support a cause such as this. My husband is a Navy veteran, and I got just a hint of some of the sacrifices made by our service members while we were stationed overseas. 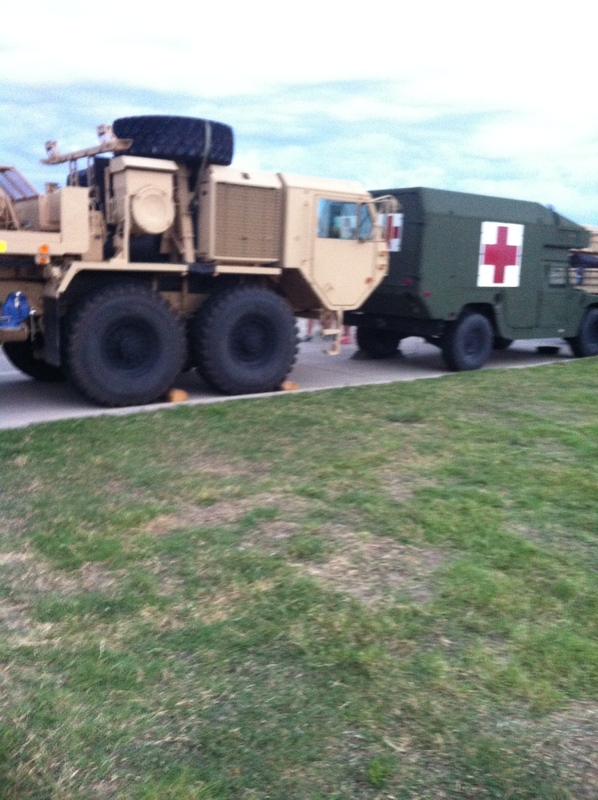 I am thankful for organizations who aid those who have given so much for our freedom. A shirt and socks! Yay! 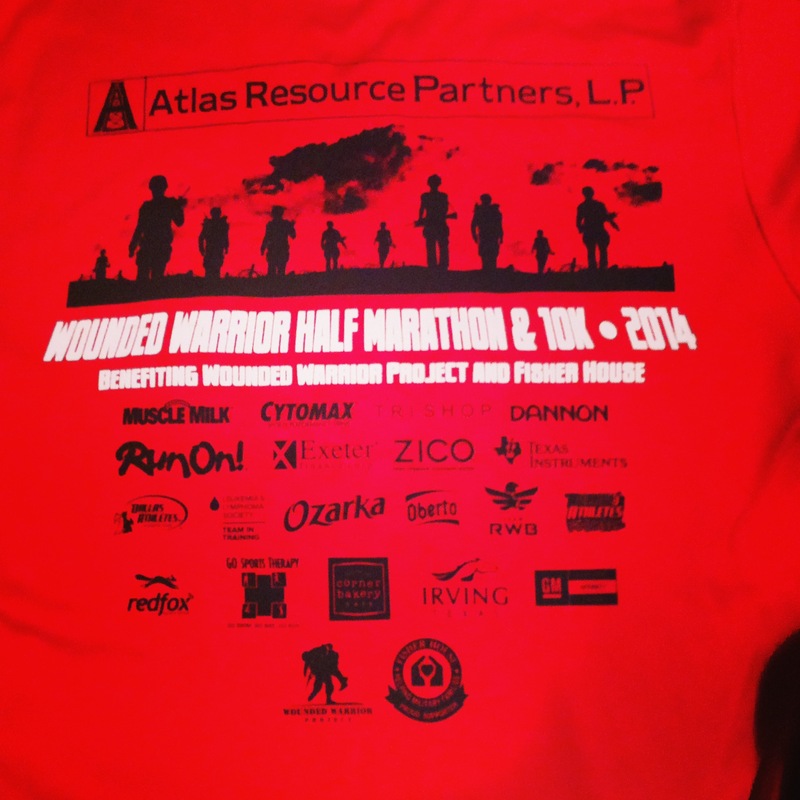 Love the back of this race tee. The race was scheduled to start at 6:45 (because that’s what we do in Texas summer heat), but there was a bit of a storm delay. I ran into someone from my running group who was running the 10k, then decided to just hang at the start line instead of the parking garage for shelter. I chatted with a runner who was running her first half marathon. After I tell her just to have fun and don’t worry about her pace, I find out she ran a 10 mile race a few weeks ago in 1:15. Wow! We talked about running and kids. She said it was nice to talk which kept her mind off the race. I was just in awe of her speed. My goals were pretty loose. Finish under 2 hours, and shoot for negative splits. I planned to start around 8:45 pace and hold steady for a few miles and drop from there. By the end of the first mile my pace was closer to 8:30. I passed the 2:00 pace group, and boy those pacers were having a blast. Singing and making jokes with other runners. In mile 4, I passed the 1:50 pace group. If I could just keep them behind me, then I would PR! At that point, I focused in on breaking 1:50. By the end of the fifth mile, my overall pace was 8:19. I felt good. I felt strong. Then a turnaround took us into the wind. I fought to keep my pace down and did okay until an uphill around mile 8. The 1:50 pace group passed me – on the hill. Oh no, I couldn’t have that! I train on hills every single day, and I was not about to lose my PR on one hill. I tucked in with the pace group and held on. I used them to help block the wind. I fought with my mind, told myself to shut up several times, and willed my legs to keep up. I imagined what it would feel like to PR in June. I started to fade around mile 10 on another uphill. My handheld was almost empty and I needed a refill. I had downed Gu at miles 4 and between 8 and 9, but I needed another one. I lost the battle with my mind and walked partway up a hill – probably about 15 seconds, then stopped at the aid station to refill and drop in a Nuun tablet (a 15 second auto pause on my Garmin). My pace for miles 6-10 averaged 8:35. Shoot! I still had the 1:50 group in sight but I wanted to walk some more. I focused on sipping my Nuun to deal with the side stitch that had developed and trudged along. I’ve never had a side stitch during a half marathon, and I know I was running hard (for me) because I sounded like I was running a 5k. Around mile 11, I spotted a runner I recognized from Instagram. I called out and introduced myself. This gave me the distraction I needed to keep from walking. He was an encourager and tried to help me chase that PR. He has done some major running in the past few weeks – including a first marathon. You can check out my Instagram in the sidebar for the photo. The light drizzle kept it cool, but I was soaked in sweat. By mile 12, I waved him on. I don’t want to be the one to hold anyone back. I fought for a strong finish, and my official time was 1:51:13. 31 seconds away from my PR. I could be upset that I was so close to setting a new PR and failed. I could berate myself for walking up that hill and stopping to refill my bottle (there’s my 30 seconds). I could chastise myself for slowing down in the second half, or going out too fast in the first half. 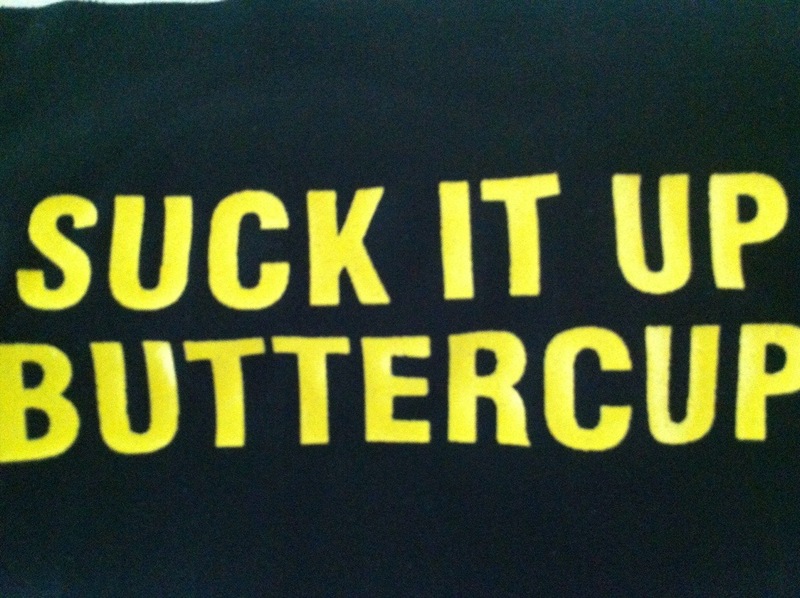 But you know what? I’m pretty content with my race. 1. I run my best in temps between 40 and 50 degrees, and humidity is not my friend. I don’t know what the exact temperature was for the race, but I’m assuming high 60s. Being so close to my PR, I know in cooler weather, I would’ve been faster. 2. I felt strong. The first half I felt like I was holding back. I can feel the difference that 5 weeks of strength training has made. 3. My legs felt like they PRed. My quads and calves still ache. 4. My mileage was pretty decent for the week and it was day 14 of the run streak, proving I tend to run my best on tired legs. Say what? I sure did need this confidence boost. 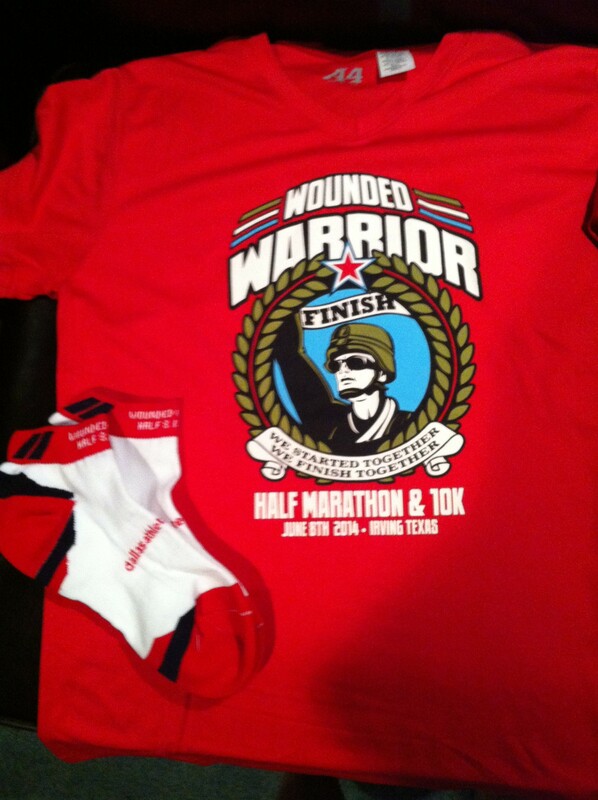 Thank you, Dallas Athletes, for a great race and for supporting Wounded Warrior project. Side note: After all this, if you watch Lone Survivor, then you may be an emotional wreck. On Saturday for our group run, I ran with a new to the group member. Our daughters have been friends for the past six years, so I knew her before either of us started running. She started running about two years ago with her first 5k. Following introductions to the other group members, I mentioned that she was planning her first half marathon. She was considering one for September but didn’t know if that was too soon. A nice group discussion ensued filled with assurance, encouragement, and advice. We ran together for six miles chatting away about how running has changed us – for the better. It’s not always about speed or distance, but being reminded of the joy of running. Let’s set specific distances aside for just a moment. Do you like to dream big? Do you have your sights set on a goal that sounds crazy to others? Do you want to run a long distance race? Is there something keeping you from taking that next step? We don’t always feel “ready.” The decision feels huge, seemingly impossible, no matter the distance. Sometimes, though, we just have to jump. So what does that long distance look like for you? For some, it is a 5k (3.1 miles), and others a half marathon (13.1). Some may be even be considering making the jump to 26.2 for a marathon. Some just need that first step out the door. My first run lasted 12 minutes almost four years ago. It’s all I could handle. Now running is a natural part of me. Oh, and by the way, if you’re looking for a great half or full marathon, join me in Houston: http://www.chevronhoustonmarathon.com. Lottery registration opens on Wednesday, June 4th. You can get the details here about registration, and see my race review from 2014 here. I’d love to see you there! Wednesday, June 4th is also National Running Day. If you haven’t taken that first step to start yet, this would be a great day to do it! You might as well jump!